Choose a strong nylon dog harness with handle and D-rings for multipurpose use on your Tibetian Mastiff. Sizes: XXS-XL. Tibetian Mastiff running exercises are daily necessity for a large, muscular dog to keep fit and healthy. Your gorgeous dog deserves the best quality dog accessories. The best seller nylon dog harness will make daily routine comfortable and pleasant! Enjoy walking your Tibetian Mastiff under reliable control! 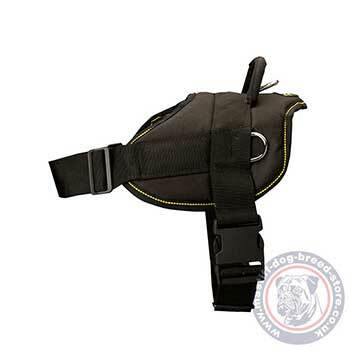 Try this large nylon dog harness with handle. It is especially designed for multipurpose use. 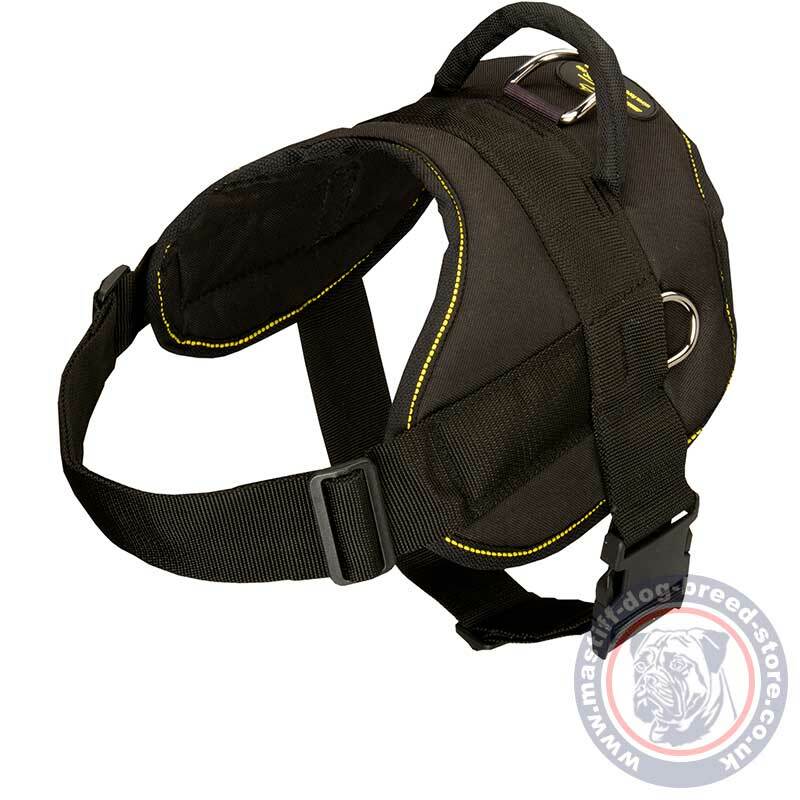 Tibetian Mastiff running dog harness is produced of premium quality nylon. It possesses the best qualities of durability, lightness, easy cleaning, drying and storage. 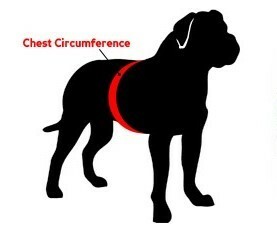 Large nylon dog harness is intended for dog walking and training in any weather! Large nylon dog harness is multipurpose. There are 2 side D rings for pulling equipment. Back ring at the handle is intended for dog walking on a leash. The rings are strong welded for secure control over your big TIbetian Mastiff. 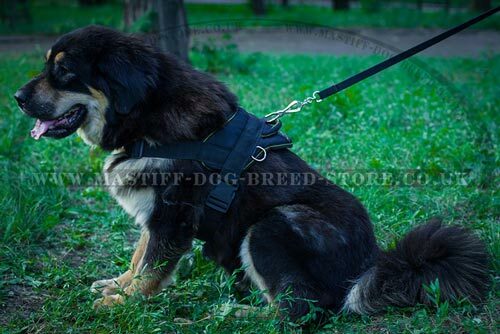 Tibetian Mastiff running dog harness is an excellent choice for dog training, tracking, weight pulling, walking and guarding. Enjoy comfort in any activity with your dog. 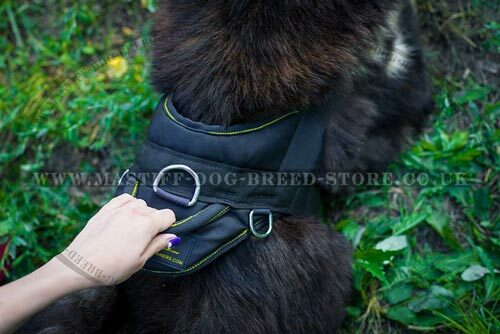 Tibetian Mastiff harness is easy to adjust with the buckles on straps to make it fit your dog maximum reliably and comfy. 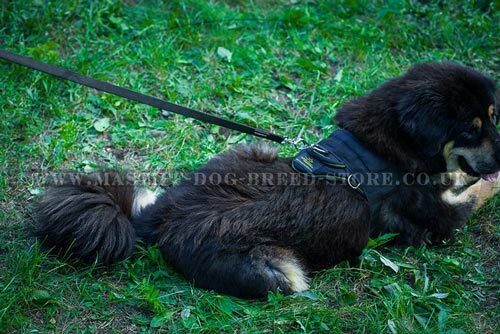 Tibetian Mastiff harness is represented in sizes from Tibetian Mastiff puppies to the largest Tibetian Mastiff size. Your dog will feel comfy and free under your control with this large nylon dog harness.